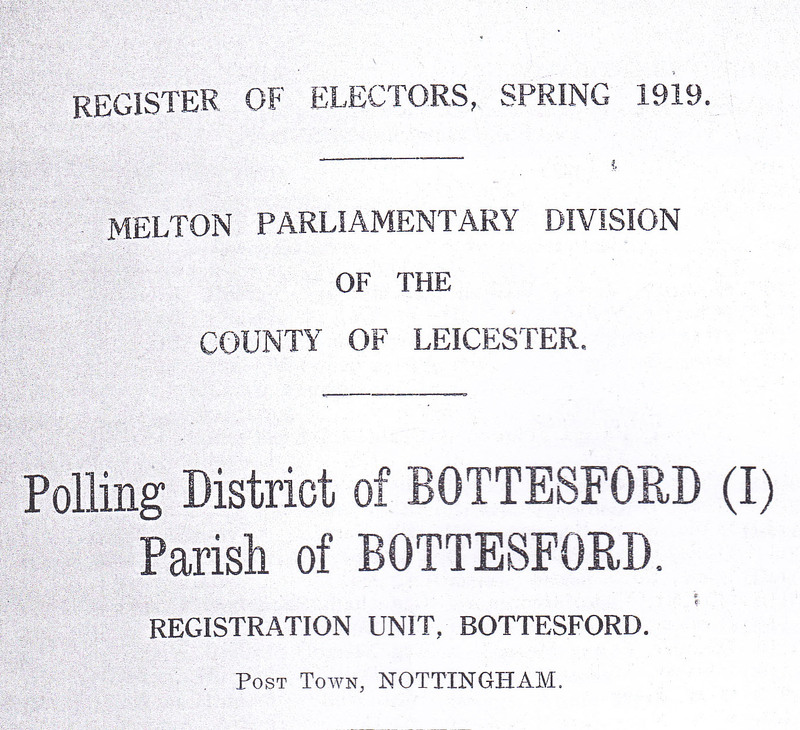 One of the sources of information that is available to us is a copy of the Register of Electors for Spring 1919, Melton Parliamentary Division of the County of Leicester, listing the electors in Bottesford and Muston. This gives the names of electors, with their residential address and information regarding their qualification for voting in Parliamentary and Local Government elections. Of special interest is the code ‘NM’ that is used to indicate a ‘Naval or military voter’. The register was drawn up after the list of Absentee Voters, and is a more systematically compiled document. The service men identified on it can be regarded as men who took part in the war which had only recently ended – in fact, it was still technically taking place and many of the men identified as ‘NM’ would still be waiting their discharge from the forces, and they can therefore be regarded as absentee voters. Searches for additional information about these men and their military service have met with at best only partial success. 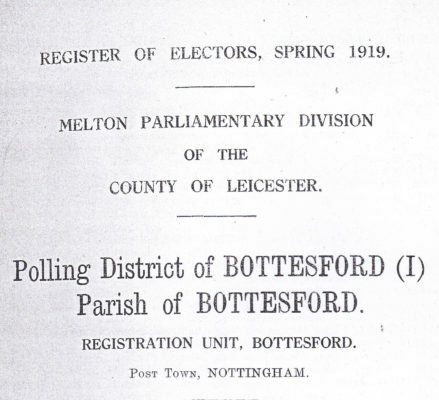 It may be that they had only recently become Bottesford residents, and they may have move elsewhere soon after 1919. Arthur William Brown lived on Bottesford High Street in 1919, though he may have been away serving with the military forces or merchant navy. No military records have been found for him, nor are their records of his presence in Bottesford before WW1. A man named Arthur William Brown was born in St Ann’s, Nottingham, in 1880, but there are no grounds to link him to Bottesford. John Robert Halis resided at a Gate House in 1919, though it is not clear which gate house tis refers to (Bottesford Station, Normanton Lane crossing or Orston Lane crossing). He may have been away serving with the military forces or merchant navy. No military records have been found for him, nor are their records of his presence in Bottesford before WW1. The result is the same if the more common name Hales is used instead of Halis, assuming there was a clerical error (‘Halis’ appears to be an old redundant form of the name). A man named John Robert Hales was born in the Grantham district in 1891, which covers Bottesford, but there are no further grounds to suggest a link between him and Bottesford. Thomas Hobden resided in Normanton in 1919. He may have been away serving with the military forces or merchant navy. No military records have been found for him, nor are their records of his presence in Bottesford before WW1. At least 34 births of boys named Thomas Hobden during the broad span from 1880-1900 were found, but all in the south of England. Similarly, 29 post-WW1 deaths were found, but again all in the south. Thomas Jennings resided with his wife Harriett on Queen Street in 1919. He was born in 1878 at Waltham on the Wolds, near Melton Mowbray. In the 1911 census, he was recorded as a 33 year old draper’s assistant living at 20 Queen Street, Bottesford, with his wife Harriett Azubah Jennings, 38, a dressmaker who came from Spilsby, Lincolnshire. There is also a record of the death of a Thomas Jennings in the Melton district in 1939. However, no military records have been identified for him. Harry Palmer resided on Bottesford High Street in 1919. In the Electoral Register he is among those who qualify to vote in parliamentary elections but not in local government elections, possibly because he was only a temporary resident of the parish. His is the name of a man born in 1895 in the Grantham district, and also of a man who died in the Grantham district in 1964. In the 1939 register, a schoolmaster named Harry C. Palmer born in 1885 lived at 21 Hill Avenue Grantham with his wife Katie who was born in 1980. Clearly, they are not the same Harry Palmers, and neither has been linked to Bottesford. A Harry Palmer married Rachel E. Barks in the Grantham district in 1912. Also, a Harry Palmer married Violet M. Dawson in the Grantham district in 1923. Either or both could refer to marriages in Bottesford. No consistent narrative can be constructed based on this information. In addition, no military records have been identified for Harry Palmer of Bottesford. John William Parnham resided on Queen Street in 1919, another of the Naval and Military voters who did to qualify to vote in local government elections. The Medal Index Card has been found for 74070 Private John W. Parnham, Royal Army Medical Corps. No other military record has been found, so the presumption must be that this is probably the man who lived in Bottesford in 1919. A man named John Parnham was born on the 2nd May 1873 and baptised on the 25th December, at Bottesford, son of Richard and Mary Parnham. In 1901, Richard and Mary Parnham lived at 2 Normanton Road, Bottesford, with their adult children John (aged 28, an agricultural labourer, like his father) and Annie (21). Richard, aged 63, was an agricultural labourer who was born in Normanton. Mary Ann was 64, and came from Osbournby, Lincolnshire. Later that year, on the 1st August, John Parnham married at Bottesford Harriett Lilly, who came from nearby Woolsthorpe-by-Belvoir. By 1911, John and Harriett had moved to 13 Chapel Street, with their children Daisy Lilly, aged 9, and George Arthur, aged 3. John Parnham died in 1943 in the Melton Mowbray district, which included Bottesford. It is tempting to suggest that John Parnham and John William Parnham were the same man, but this has not been proved. John Edward Price resided on Bottesford High Street in 1919. No military records have been found for him, nor are there records of his presence in Bottesford before WW1. He might have been the John Price, a single man born in 1886 at Stoke-on-Trent, who in 1911 lived at Belvoir, where he worked as a chauffeur. There was a John Edward Price born at Ashby-de-la-Zouch in 1884 who became Lance-Corporal 8/14371 8th Leicestershires, a machine-gunner who was sadly declared missing, Killed in Action, on the 15th July, 1916, but this cannot have been the man who was in Bottesford in 1919. John Stubbings resided on Bottesford High Street in 1919, but no military records have been found for him, nor are there records of his presence in Bottesford before WW1. Harry Weston resided at The Wharf in 1919, indicating one of the wharves on the Grantham Canal. In the 1911 census, Harry Weston, born on the 24th June, 1883, at Redmile, was living at Muston Coal Wharf, Bottesford, where he worked as a coal waggoner. His wife was Rose Worrell, born in 1883 at Gosport, Lancashire, and they had two children Charles and Clara. Rose’s father Stephen Henry Worrell was also living with them in 1911. Harry and Rose had married on the 22nd May 1905 at Redmile. Harry died in 1972 at Little Dalby, Leicestershire. However, no military records have been found for him. This page was added on 19/06/2017.